“It’s been tough,” USRA B-Mod driver Taylor Moore said. “The main thing is you want to try and get comfortable with the weather and the car working together as one. It’s been hard to do that. After two postponements, Lucas Oil Speedway again will try this Saturday to open the 2018 Big Adventure RV Weekly Racing Series. It’s $uper $aver $pecial Night Presented by OnMedia/Dish/DirectTV with discounted admission for action in all four divisions – Pitts Homes USRA Modifieds, Ozark Golf Cars USRA B-Mods, Warsaw Auto Marine & RV ULMA Late Models and Big O Tires Street Stocks. The USRA B-Mods will be featured, running a special 25-lap, $750-to-win main event. Gates are set to open at 4 p.m. with hot laps at 6:30 and racing at 7:05. It’s been 12 years since Forrest Lucas converted Lucas Oil Speedway into the gem we know it today. 1 – Weekly racing is alive and well. Lucas Oil Speedway averaged 105 cars and 2,400 fans for its Big Adventure RV Weekly Racing Series in 2017. Racing again will be held in four weekly divisions with the same sponsors returning as the Pitts Homes USRA Modifieds, Warsaw Auto Marine & RV ULMA Late Models, Ozark Golf Cars USRA B-Mods and Big O Tires Street Stocks compete. The top 10 in points will be honored and collect prize money and contingency awards at the postseason banquet. 2 – Show-Me 100 goes live, worldwide. 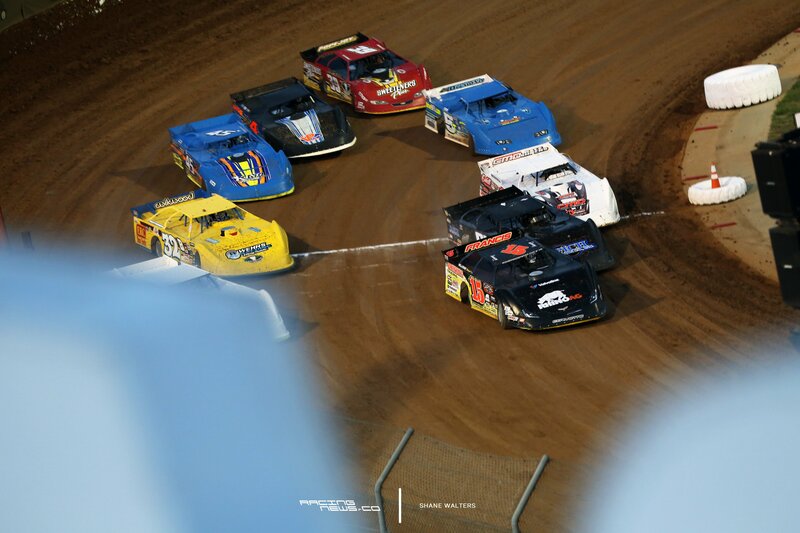 For the first time in its 26-year history, the full final-night program of the Show-Me 100 Presented by ProtecttheHarvest.com will be televised live on MAVTV Motorsports Network along with LucasOilRacing.TV. The crown-jewel event, which pays $30,000 to win, was captured a year ago by young phenom Bobby Pierce who is now a regular on the Lucas Oil Late Model Dirt Series. 3 – New voices join announcing team. As Lucas Oil Speedway continues to expand its national television profile, its announcing stable has grown as well. Ozarks-area radio and television announcers Corey Riggs and Shane Friebe have joined the speedway as play-by-play voices. Several times during the 2018 season, the Big Adventure RV Weekly Racing Series will be spotlighted on “Lucas Oil Speedway Saturday Nights” on MAVTV and LucasOilRacing.TV with Riggs and Friebe calling the action. 4 – Cutshaw takes aim on 5th straight. Bolivar’s Jeff Cutshaw will try to make it an unprecedented five straight track championships in the Pitts Homes USRA Modified division. Other reigning track champions are Appleton City’s Johnny Fennewald (Warsaw Auto Marine & RV ULMA Late Models), Andy Bryant of Fort Scott, Kansas (Ozark Golf Cars USRA B-Mods) and Wheatland’s Toby Ott (Big O Tires Street Stocks). 5 – Off Road mania returns. The Inaugural Lucas Oil Off Road Racing Series was a smash hit, with big crowds and thrilling action on the new off road course last July. This year, the high-flying jumps and full-contact action is set for June 22-24 with the 2nd annual GEICO Off Road Shootout Presented by General Tire. Meanwhile, the track also will host several different off road series in one-day shows during the 2018 season. 6 – Blazing trails on the water. The summer months will find the blistering speed of the Lucas Oil Drag Boat Series returning to “Lake Lucas.” Last year’s Labor Day-weekend Diamond Drag Boat Nationals proved memorable as both Scott Compton in “Liquid Voodoo” and Bryan Sanders in “Nitrochondriac” posting qualifying runs of 270 miles-per-hour in their top-fuel hydro machines. This year, the John Haas Memorial is set for June 8-9 with the Diamond Drag Boat Nationals Aug. 31-Sept. 2. 7 – Open-wheel action. The dirt track is not limited to the Late Models, Mods and Street Stocks. Sprints and Midgets always offer some of the most-exciting action of the season with the 7th annual Impact Signs Awnings & Wraps Open Wheel Showdown set for May 5. Later in the fall, the 8th annual Jesse Hockett/Daniel McMillin Memorial – this year set for Sept. 20-22 – has become one of the nation’s biggest events of the Lucas Oil ASCS Winged Sprint Car schedule. 8 – Top Modifieds with a side of BBQ. The United States Modified Touring Series brings the nation’s premier Modified drivers to Lucas Oil Speedway on Aug. 4 for the 9th annual Slick Mist Show-Me Shootout Presented by Foley Equipment. As an added highlight, the 2nd annual Red White Blue & Que will be going on with professional barbecue teams set up on the Lake Lucas midway. Some special events, including cooking demos with the Great American Cookout Tour, will be available to the race fans. 9 – Big Buck 50 expands. It’s become so popular, putting Street Stocks into the spotlight, that the 5th annual Big Buck 50 Presented by Whitetail Trophy Hunt has expanded to three nights (Oct. 4-6). The winner of the final-night feature will take home $10,000 – double the previous prize – and a free entry into the Whitetail Trophy Hunt in mid-Missouri. The ULMA Late Models will compete for $2,000 to win in the Saturday feature. 10 – Trucks, big and powerful that pull and crush: The Lucas Oil Pro Pulling Nationals return on Sept. 14-15, featuring some of the most-powerful Modified trucks and tractors in the world. The traditional season-ending program is set for Oct. 20 with the Monster Truck Nationals “Eve of Destruction,” a fun time for fans of all ages with a Halloween theme. 11 – New sign/earlier starting times. Racing will begin earlier in 2018 for most programs with gates opening at 4 p.m., hot laps at 6:30 p.m. and opening ceremonies at 7. Visitors also will find a new sign at the entrance to the speedway – from Impact Signs Awnings and Wraps – off Highway 54, featuring a NextLED video board. 12 – Bull rides? You heard that right. It’s not motorsports, but the excitement level should be high as the Lucas Oil Invitational Pro Bull Ride Presented by ProtecttheHarvest.com makes its debut with nighttime shows at the Off Road venue, June 29-30. Check out AmpedUpProBullTour.com for more details. Opening night: This Saturday night, Lucas Oil Speedway again will try to open the 2018 Big Adventure RV Weekly Racing Series. It’s $uper $aver $pecial Night Presented by OnMedia/Dish/DirectTV with discounted admission for action in all four divisions. The USRA B-Mods will be featured, running a special 25-lap, $750-to-win main event. Gates are set to open at 4 p.m. with hot laps at 6:30 and racing at 7:05. The first 500 fans also will receive a free 2018 Lucas Oil Speedway schedule magnet, courtesy of City Magnet. Lucas Oil Speedway is considered by fans, drivers and industry insiders to be one of the top five racing facilities in the nation. Located in Wheatland, Missouri, approximately an hour from Springfield, Missouri, and just an hour and a half from the Kansas City metro area, the “Diamond of Dirt Tracks” lives up to its title. Twenty-One VIP Luxury Suites, HD Jumbo-Tron Screen, Stadium Style Musco Sports Lighting, a Bose Sound System, Go-Kart Slick Track, The Diamond Bar, Track Treasures Gift Shop, the best track food in the country and paved pits are a few of the spectacular amenities setting the Diamond of Dirt apart. This year marks the 8th season for the Liquid Quarter Mile Drag Racing Lake, “Lake Lucas.” Two nationally televised Drag Boat Races featuring the Lucas Oil Drag Boat Racing Series are held annually. New for 2017 was all-purpose built Off Road facility featuring the Lucas Oil Off Road Racing Series as well as a host of other regional events. Lucas Oil Speedway’s dirt oval track plays host to some of the largest and most-popular events in the Midwest with national and regional touring series appearing frequently including: The Lucas Oil Late Model Dirt Series, POWRi Midget National Series, Lucas Oil Pro-Pulling League, United States Modified Touring Series, ASCS Sprint Cars and the Lucas Oil MLRA. In addition to the special events, the Lucas Oil Speedway Big Adventure RV Weekly Racing Series features the Warsaw Auto Marine & RV ULMA Late Models, Pitts Homes USRA Modifieds, Big O Tires Street Stocks and the Ozark Golf Cars USRA B-Mods.